Crimson Trace has been around for a while in the firearms industry. Just about everyone seems to be familiar with their lines of grip integrated lasers for just about every pistol known to man, as well as their flashlights and other pistol oriented products. 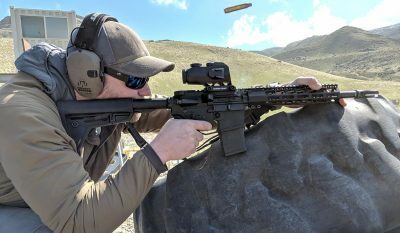 When I brought the Crimson Trace CTS-1100 scope to the range, though, I was met with some surprised faces; most people, even those pretty entrenched in the industry, aren’t aware that CT has begun to make rifle optics. And I’d have to say, they clearly did their homework on what features shooters want in their optics – and they’re right on track! The idea behind this sight is similar to that of most low power fixed magnification sights: provide enough magnification to ID and engage smaller or partially obscured targets at mid-range, but low enough magnification to have an adequate field of view for up close target transitions. The majority of optics in this category range from 3x-5x and have a BDC reticle. The CTS-1100 is fixed at 3.5x and also includes a BDC reticle, which I will discuss a bit more later on. Another common feature of sights in this category are integral mounts, which the CTS-1100 also has. Overall, the CTS-1100 is a low-power battle sight that has all the standard features you would expect on such a scope in this category. Crimson Trace specifically states in their description of the CTS-1100 that it “provides a superior field of view for engaging targets at close, mid-range and long distances, elevating your long gun’s performance instantly,” so I decided to test it at close, mid-range and long distances to see how it would do. After zeroing the CTS-1100 (which was a fairly routine process: shoot, adjust, shoot, adjust, confirm) I engaged several targets of varying sizes from distances of 75 yards to around 300 yards. I didn’t use subtensions on the BDC for targets at these ranges and simply aligning the triangle at the top of the post on the reticle center mass of the target and let them fly. A slightly higher point of aim was required for some targets further out, but I found myself still using the tip of the triangle as my focus point on the reticle. And just to clarify, these weren’t full size IPSCs, these were 12” diamonds, 6” – 10” hexes and other, non-minute-of-silhouette size targets. I feel at these distances, with these targets, the CTS-1100 was in its element. Having done remarkably well at mid-range, I was hopeful that optic would perform reasonably well at long range (for the platform that is, which was a GGP SBR) engaging targets from 400 – 600 yards. I am primarily a precision long range shooter and enjoy taking rifles and optics to their distance limit. I have been shooting long range for the last 13 years, and have competed in local and national matches for the last decade. The distance targets at my home range are pretty small, in the 2.5 MOA or less range, which didn’t help much in this exercise. I struggled to get hits at 400 and 500 yards, and never got a hit at 600. Again, the targets were small, and I was shooting an SBR, so I’ll give the CTS-1100 an alibi. I suspect either having the optic on a 16” gun or shooting larger targets would have greatly increased my hit percentage. For the final exercise, I moved to one of the pistol/carbine bays where we have targets ranging from 20 – 60 yards. There is an assortment of silhouettes, hostage targets, a plate rack and a spinner target among other miscellaneous pieces of steel in the bay. I found the reticle easy to pick up while aligning it with targets, and was able to transition between targets without having to look over the optic for orientation. I am very fortunate to have access to an incredible range with high level shooters of all disciplines, most of whom are pros, or otherwise sponsored shooters. Since close up work with a carbine isn’t my specialty, I wanted to get the perspective of some of our local 3 Gun wizards. Their opinion was pretty consistent: the reticle was great, and overall the CTS-1100 performed very well engaging all targets in the bay as well as the mid-range targets. One 3 Gun pro even mentioned that he’d like to put one on his PCC specifically for targets 100 yards and beyond. I think the CTS-1100 would be best suited for a “do-it-most” semi-auto rifle in the 14.5” – 16” range. It is a very well thought out and configured optic for its genre, and with a $500 MSRP ($450 street price), I’d consider it a strong competitor, and high value option. The post Crimson Trace CTS-1100 Review appeared first on OutdoorHub.